This is a common red-fruited species of peaty soils and rotting wood. The stout stems (podetia) grow from deeply incised platy squamules and terminate in a shock of narrow tapering branches topped with red discs. In well-developed specimens these narrow branches sometimes expand to form cups with finger-like margins also bearing red discs or smaller, red-tipped pycnidia (like discs in miniature). 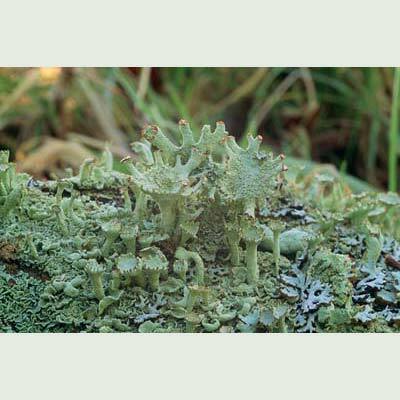 Unlike C. diversa (which is yellow-green) it lacks cups directly above the stems (podetia); it differs from C. floerkeana in its narrow, tapering branches ending in discs or cups and the Pd + orange reaction of the thallus. Simms, M. J., (2016). 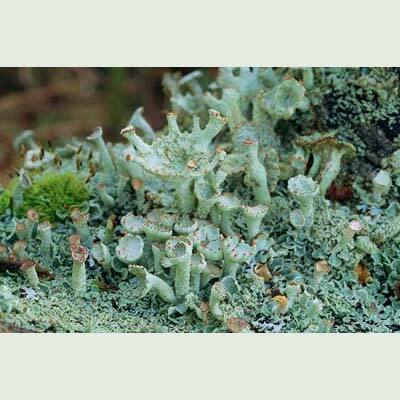 Cladonia polydactyla (Flörke) Spreng.. [In] LichenIreland.